At brightspot, we're a little obsessed with how the workplace can enhance employee engagement through more than just design. The workplace is the primary channel organisations can use to engage employees. In fact, workplace satisfaction correlates highly with engagement; the most engaged employees rate their workplace in the 90th percentile. You might ask, why is the workplace such an important factor for engagement? 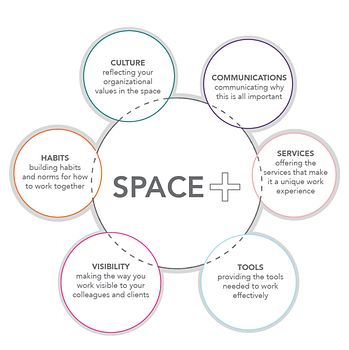 It’s because when each component of Space+ comes together, it provides the recipe to create an integrated work environment that supports all of these experiences. So, how can you achieve these 8 attributes in your workplace and change process? 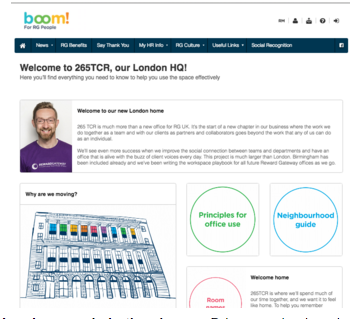 Below are a few suggestions from our work with Reward Gateway’s London office where we focused on engaging staff in the process of planning the workplace and managing the change, so they OWNED IT by the time they moved in! 1. Live your values. Demonstrate how the way people work aligns with your organizational values and is supported by the workplace by developing custom work modes for your organisation. 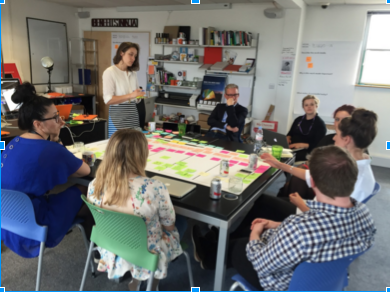 For instance, in this snapshot, “Buzzin” is when people are working alone together, like at a coffeeshop; this time is important for moving ideas forward through collaboration, and correlates to RG’s value of Owning It and is best supported in the Living Room and Kitchen. 2. Communicate, Communicate, Communicate. Provide multiple opportunities for people to learn about the workplace vision, design, and ways to work in the future, whether it is on your communication platform (like below) or in work sessions and tours. 3. Involve people in the change. Bring people along in the change by involving them in the change process. At Reward Gateway, we developed workplace champions who led engagement with staff through tours, training sessions, and communications. 4. Walk the walk. Lead by example. Your workplace should reflect your company culture and values. Use the space to demonstrate your values in how people work. At Reward Gateway this was about building connections with clients by inviting them into the office and supporting workplace flexibility by encouraging people to work wherever they are most productive. 5. Listen. When going through a workplace change, make sure to provide resources to communicate the change to your team and listen to their concerns and questions. At Reward Gateway, this was done through listening sessions. We’ll be back in a few weeks to share some of the pre- and post-move staff survey findings on workplace satisfaction, productivity, and engagement from the Reward Gateway London team. In the meantime, think about how your workplace can be more than the sum of it’s parts and whether it is currently helping you achieve your engagement goals! Amanda Kross is the associate director at brightspot. brightspot is a strategy consultancy that partners with leading universities, cultural institutions, and companies to envision and plan for their future spaces, services, organizations and experiences. The organisation uses an engaging process that results in transformational strategies that help people better connect to a purpose, to ideas and information, and to each other.